Who did you expect? The Easter Bunny? As the holidays drew near, we began to wonder what this year’s Doctor Who Christmas Special would bring. Even the name of this year’s special, “Last Christmas,” helped get us in the holiday spirit. Enjoying an episode of Doctor Who after Christmas dinner has become a regular tradition, with this year being the 10th special. 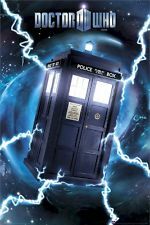 There have been a lot of good Christmas specials, which we recently ranked in “Doctor Who: Christmas Specials from Best to Worst.” After seeing Santa appear in the TARDIS at the end of the last episode of this season, “Death in Heaven” (S08E12), the anticipation for “Last Christmas” was high. 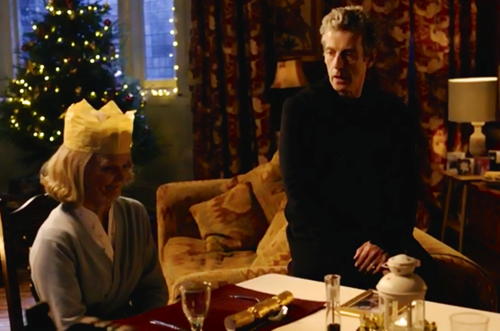 “Last Christmas” included some classic British holiday customs, which is a nice touch for a BBC show that is televised around the world. At one point Clara refers to Santa as “Father Christmas,” the traditional name for the figure associated with Christmas in the United Kingdom. There are several very funny comments about tangerines, referring to the British custom to include a tangerine in a Christmas stocking, often alongside nuts, an apple, and chocolate coins. “Last Christmas” also uses the quintessential British Christmas pop song “Merry Xmas Everybody” by Slade. The song has been used in previous Doctor Who Christmas specials as well – in Mickey’s garage during “The Christmas Invasion,” at Donna’s reception in “The Runaway Bride,” and when Donna and her family are opening presents in “The End of Time.” You can’t deny a classic. Christmas is about traditions, so references to these British Christmas conventions adds to the celebratory spirit and reminds us all that Doctor Who has been part of the United Kingdom culture for over 50 years. One of the charms of Doctor Who for the rest of the world is its willingness to keep being British, even with its broadening appeal. 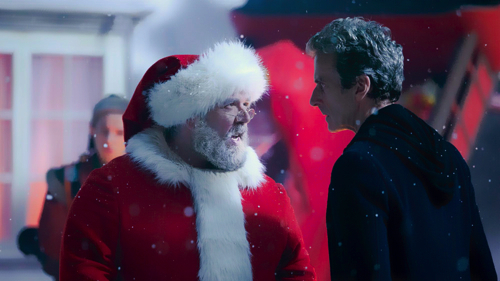 The popularity of the Doctor Who Christmas special, which draws additional viewers, means that Steven Moffat was able to create a very strong cast for “Last Christmas.” We are big fans of Nick Frost (Hot Fuzz is one of our favorite movies), so when he appeared as Santa in the final scene of “Death in Heaven,” our interest was piqued. The portrayal of Santa as the godfather of Christmas was clever and terrifically funny. Santa’s lines could have fallen flat in the hands of a less skilled comedic actor, but Frost really made the episode. 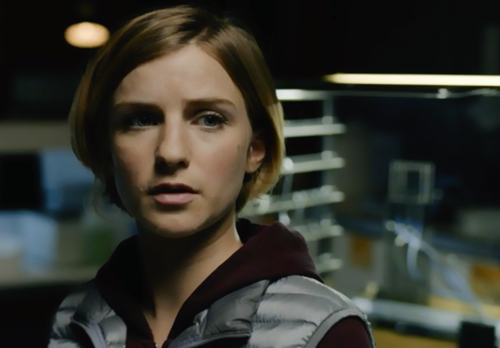 Fay Marsay as Shona. Will she get her wish for a curry-filled reunion with Clara and the Doctor? 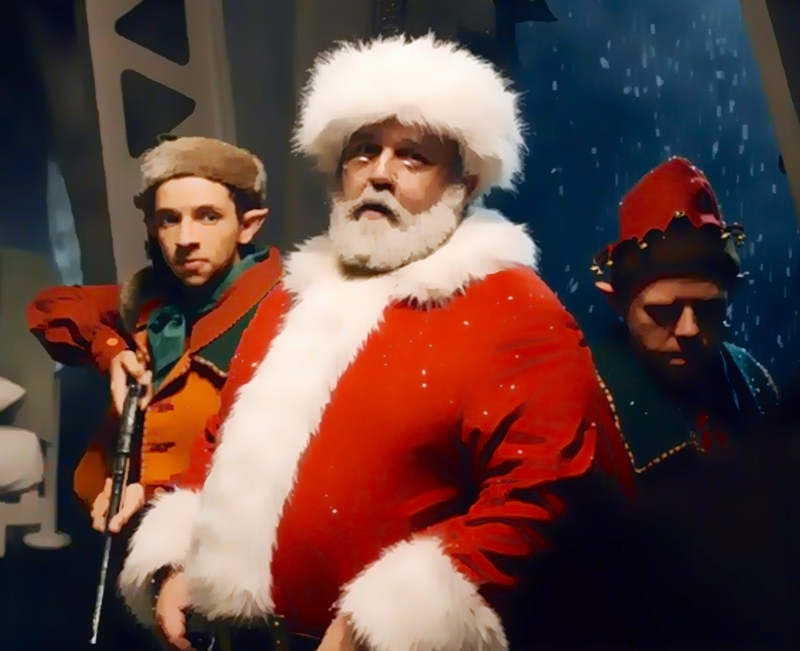 Santa was accompanied by elves played by Dan Starkley, who normally plays the Sontaran Strax, and Misfits’ Nathan McMucllen. 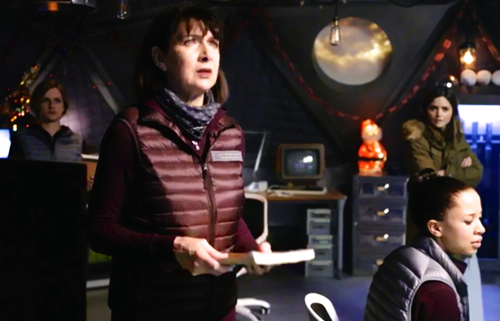 A group of Arctic scientists were played by award-winning actress Natalie Gumede, Maureen Beattie, Michael Troughton (the son of second doctor actor Patrick Troughton), and Faye Marsay. Marsay’s humorous performance as Shona left some calling for her to become a future companion… not us, but some. Finally, Samuel Anderson provided viewers with what we can only assume was his final performance as Danny Pink. 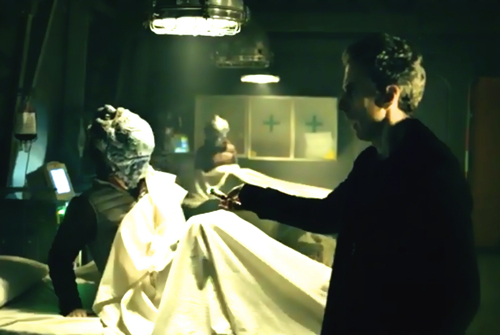 At the end of “Death in Heaven” Clara had said good-bye to the Doctor. They had lied to each other—Clara letting the Doctor think Danny was still alive, and the Doctor telling Clara he had found Gallifrey—in an attempt to let each other follow their own path. Their sorrowful farewell during “Death in Heaven” was intensified by reports that it was the end of the role for actress Jenna Coleman, who plays Clara. But all of this merely set the stage for the Christmas Special. Clara Oswald, marginal for the naughty list in ’93. At the beginning of “Last Christmas,” Clara is awoken from visions of sugarplums dancing in her head by the sound of a crash from above. She heads up to the roof in her dressing gown, only to find Santa and two of his elves. Santa finally drops the not-very-convincing pretense of being roof workers when a couple of reindeer fly by. They have a funny exchange about the existence of Santa. Clara does what she is told – it’s a Christmas miracle! Don’t badmouth the tangerines! They’re Santa’s signature gift, along with the walnut. Don’t look, don’t think, just dance. Shona makes her way though the sleepers. We head to a science base situated in a dark, Arctic landscape. There is team observing one of its members, Shona, as she heads into the infirmary. We don’t know what the problem is, but from what they are saying, it sounds quite serious. Shona is reminded that she must not wake up the sleepers in the infirmary. She cannot think about them or look at them or they will awaken. 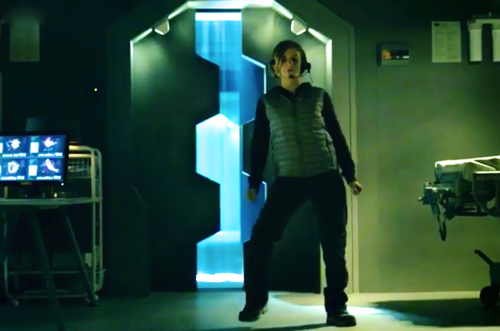 As “Merry Xmas Everybody” plays in her headphones, she dances her way through the infirmary with her eyes closed. Best use of pop music in a Christmas Day special since Gavin and Stacey. Suddenly an external door opens and Shona screams, telling the team they have ghosts, “It’s a skeleton man and a girl in a nightie.” As the Doctor and Clara walk in, Shona yells that they are making her think of the sleepers. The Doctor immediately scans the sleepers. 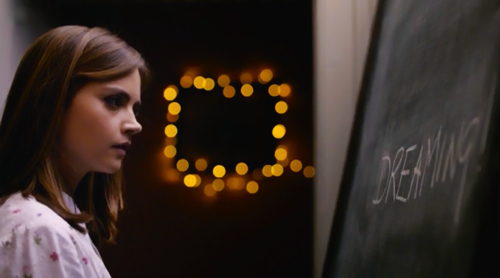 When it becomes clear to him that they need to stop thinking about the sleepers he tries to distract Clara with math. When that doesn’t work he asks, “Danny Pink! What is Danny Pink up to right now? He’s probably flirting with your neighbor or texting women of low moral character.” Clara slaps the Doctor and the creatures stop moving. She tells him that Danny is dead. It happens very quickly and before we get a chance to process this moment, the observation team storms in with guns as creatures start to drop on them from the ceiling. With 526,403,012 children expecting presents, Santa has a second sled. When Shona questions his presence, he calls her out on her fondness for My Little Pony. Santa tells the Doctor that the cause of the trouble is the Kantofarri, known as Dream Crabs. Doctor Who is a little hit or miss when it comes to names this season. We liked the names the Nethersphere, the Architect, Skovox Blitzer, and the Foretold, while Boneless and Dream Crabs were not our favorites. 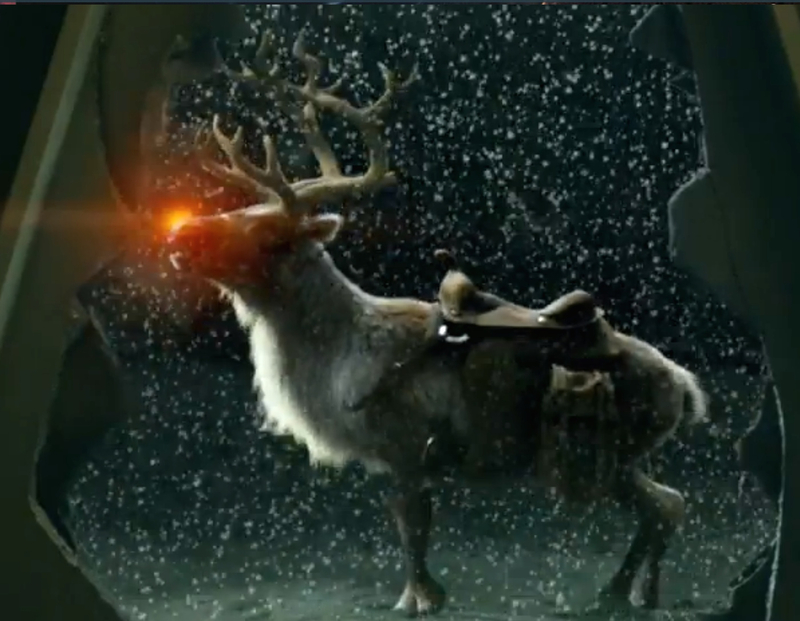 It’s a scientific impossibility for reindeer to fly— that’s why Santa feeds his magic carrots. Shona talks to Santa and his elves about the North Pole (Ian has a selfie of himself with the pole), delivering presents (obviously Santa has a second sled), and flying reindeer (they eat magic carrots). She remains skeptical. When the Doctor asks how he gets all the presents in his sleigh, Santa responds, “It’s bigger on the inside.” Nice. It’s hard to tell fantasy from reality. Don’t we know it. The Doctor asks the scientists about how they came to find the Dream Crabs and what happened to their crew. When he asks each of them about details of their mission, they individually respond, “It’s a long story.” He asks Clara to bring him the dead specimen that Santa brought. Clara goes to get the specimen, but because they are all thinking about the Dream Crabs, the crabs are awoken and she is attacked. You are dreaming. You are dying. 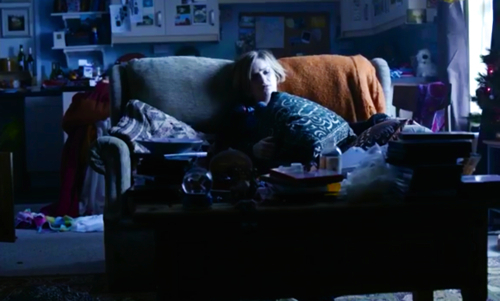 The scene changes to Clara waking up at home on Christmas morning with Danny. In her happiness at seeing Danny, Clara disregards the messages that she is dreaming, that she is dying. She chooses to ignore the literal writing on the wall so she can enjoy Christmas with Danny—and who can blame her? After being unsuccessful in waking her, to get her out of her dream the Doctor decides to join her dream state by allowing one of the Dream Crabs to seize him. Despite the Doctor’s presence Clara is still reluctant to leave her dream state. Dream Danny tells her that she is allowed to miss him for five minutes a day, but that the rest of the time she must live her life. He tells her she must wake up. This is now the third episode we’ve said goodbye to Danny. We mourned him when he died in “Dark Water” (S08E11). He broke our hearts when he came back as a Cyberman and sacrificed himself to stop the rain that would destroy humanity in “Death in Heaven” (S08E12). 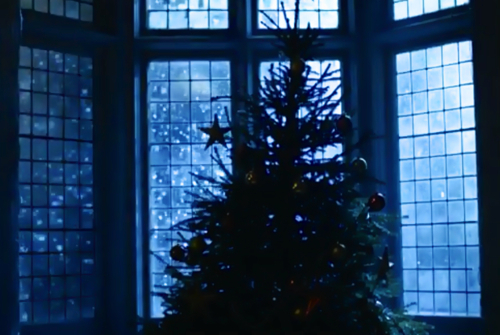 Now “Last Christmas” makes us miss him all over again when Clara has to let Dream Danny go in order to live. The Doctor and Clara wake up. The Dream Crabs detach, squirm around a bit, and then disintegrate on the ground. Gross. Apparently the Dream Crabs will die when the sleeper awakes. The Doctor points out that they still have the pain on the side of their heads, indicating a Dream Crab is dissolving their brains. The scientists acknowledge they have the pain as well. When Clara says she can’t be in a dream because she just woke up, the Doctor asks if she has ever woken up from a dream and realized she was still dreaming. The team fails the dream test. In order to test his theory that they are still in a dream he uses the Helman-Ziegler dream test, in which they compare randomly chosen words from the same pages of identical texts, in this case their base manuals. 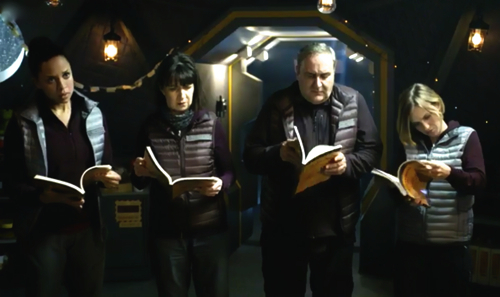 When they each read out the first word on page 24 of the manual, they get the words “We.” “Are.” “All.” “Dead.” The Doctor points out that when they all met they were under attack by the Dream Crabs in the infirmary, then they were rescued by Santa Claus. They realize that they are all still under attack by the Dream Crabs and that nothing since the infirmary has been real. Santa explains it all: it’s a bit dreamy-weamy. Alas, the Easter Bunny never gets the text, or maybe he’s slated for a future Easter special. When Shona asks Santa if he’s a dream that’s trying to save them, he replies “Shona, sweetheart, I’m Santa Claus. I think you just defined me.” Santa has everyone hold hands, despite the Doctor’s resistance, and they wake themselves up. “This isn’t Facebook.” Is the Doctor on Facebook? 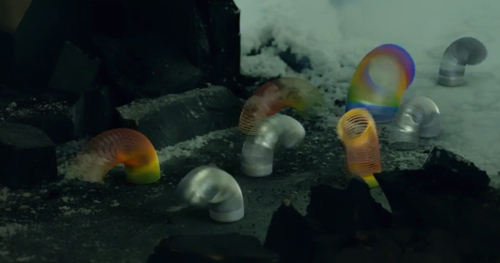 As they awaken, the Dream Crabs detach from their faces and they escape from the four sleepers still in the infirmary. The Doctor immediately heads outside to the TARDIS, telling Clara, “No need for chatting, you’ll only get attached. This isn’t Facebook.” He tells Clara the four sleepers in the infirmary can’t be saved. Then Clara asks the Doctor, “If Santa was only in the dream, why was he on my roof?” The Doctor turns around and goes back into the base, saying he has missed the obvious—although, as usual, fails to tell anyone what that is. He throws the crew the manuals to take the dream test again, and the result this time is, “Very.” “Very.” “Very.” “Dead.” They realize that they still have the pain in their heads. The Doctor points out that there are only four manuals, which wouldn’t make sense if there were eight crew members. He tells them to look at the sleepers properly so they can see that the sleepers are, in fact, them. When Shona asks how that can be, the Doctor says that they are probably scattered all over the world in their own homes and he’s asleep in the TARDIS. They are all trapped by the Dream Crabs and networked together through the same nightmare. At this point the sleepers begin to walk towards the observation camera. The scientist Albert begins to walk towards a monitor and before he can heed the Doctor’s warning, he gets pulled into the screen. The Doctor tells them all to run outside as the sleepers start to come through the monitors. Standing outside in the Arctic, they are at risk of freezing to death, which the Doctor points out is likely to result in their deaths in the real world. The Doctor says that they will die, just as Albert did, if they cannot figure out how to wake up. The sleepers are punching their way through the metal doors of the base. 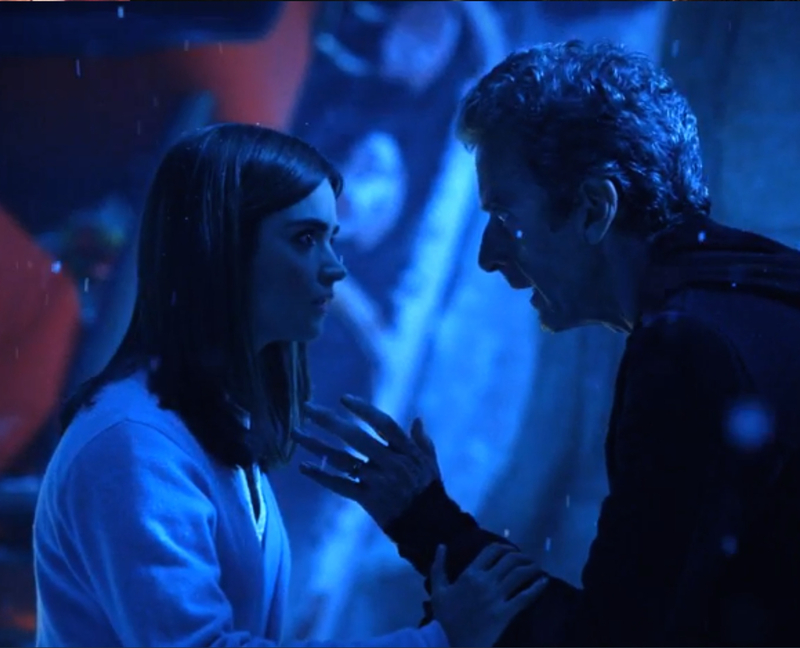 When they try to escape into the TARDIS, sleeper versions of Clara and the Doctor emerge from the ship. 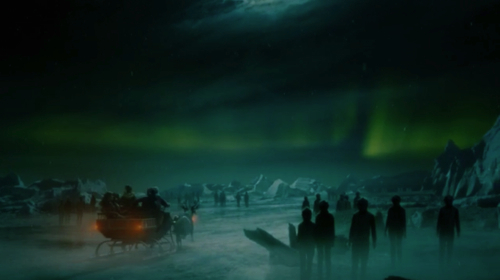 As they are surrounded by sleepers, the Doctor tells them they must use their imaginations to dream themselves home. Just as the Doctor exclaims, “Come on, it’s Christmas, the North Pole. 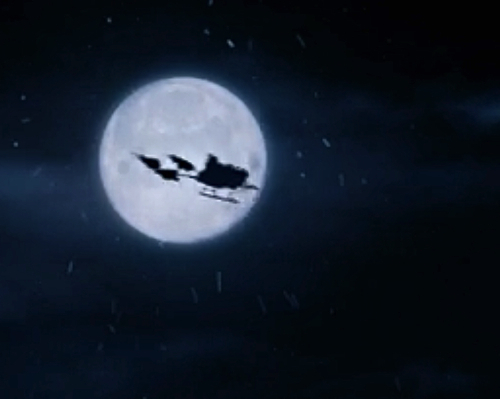 Who you gonna call?” Santa arrives and tells them to get into his sleigh, and they take off into the night sky. 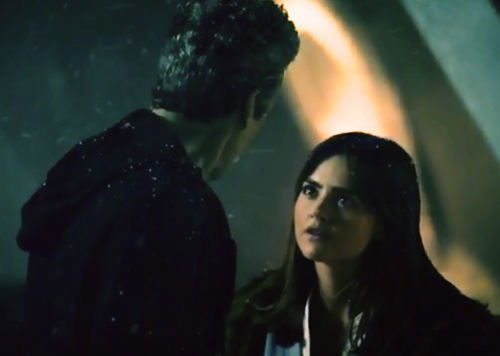 The sleigh flies through the snow, and Clara asks what will happen now. The Doctor asks her if she believes in Santa Claus and she responds, “I’ve always believed in Santa Claus. But he looks a little different to me,” then hugs the reluctant Doctor. 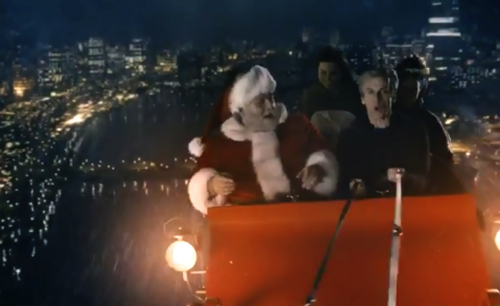 Santa offers to let the Doctor take the reins, and even though the Doctor realizes it’s a dream construct, he takes the reins and seems surprisingly excited. We prefer Peter Capaldi serious and sarcastic, but at least when he’s acting enthusiastic it’s only in a dream. As the sleigh descends below the clouds, they see the London skyline. Shona and Ashley begin to remember their lives. When they realize they may not know each other in real life, Shona wants to exchange numbers and have a reunion. Then Bellows disappears and wakes up in a wheelchair in her family home. The Dream Crab is crumbled on the floor beside her. Back in the sled, Shona continues to insist they should get together in the real world. Ashley disappears and wakes up in bed next to a dying Dream Crab. Shona asks Clara if she wants to hang out some time and Clara responds, “Sure.” Shona asks Santa if she can stay a bit longer, but then vanishes. She wakes in her flat with her Christmas itinerary of movies to watch. At the bottom of her list it says “Forgive Dave?? ?” and after thinking a moment, she checks it off. Clara says that it’s a pity they have to wake up. The Doctor reminds her that if they stay, they die. By the time Clara responds, he has already gone. The Doctor wakes up on a volcanic ledge, calls Clara’s name, and dashes into the TARDIS. Back on the sleigh, Santa tells Clara that she should be waking up too. She says she wants to stay a little longer because “Every Christmas is last Christmas.” Clara might not be eager to return to the real world, where she continues to struggle with Danny’s death. 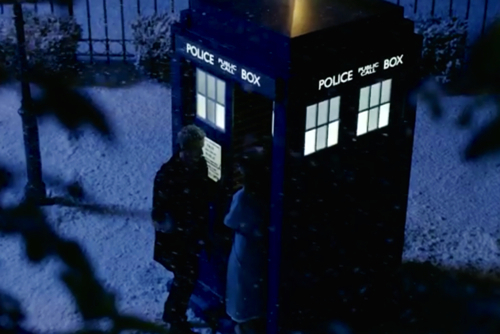 The TARDIS materializes outside of Clara’s house. 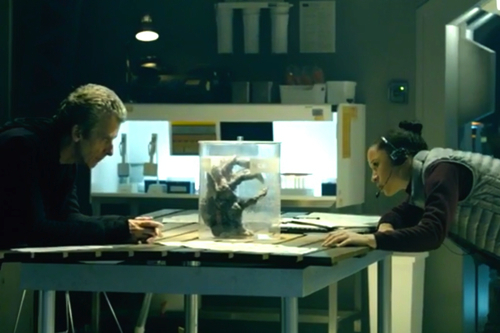 The Doctor goes up to Clara’s bedroom carrying an empty specimen case. Clara is lying in bed with the Dream Crab wrapped around her head. The Doctor uses his sonic screwdriver to remove the Dream Crab, which apparently he now knows how to do because he is awake. It turns out it has been 62 years since Clara last saw the Doctor and she has grown old. The Doctor wakes up on the volcanic ledge again. He returns to Clara and when he removes the Dream Crab he finds that Clara is still young. Clara’s apparent relief at not having aged indicates that the dream of her having grown older was a shared experience. The Doctor tells Clara that the TARDIS is outside and that all of space and time is waiting for her, so she shouldn’t even argue. She takes his hand and kisses his cheek and they wish each other a Merry Christmas. Once they are outside by the TARDIS, Clara points out that the Doctor looks happy, and how rare that is. The Doctor says, “Do you know what’s rarer? Second chances. I never get a second chance, so what happened this time? Don’t even know who to thank.” As the TARDIS starts to dematerialize, we see a tangerine sitting on the ledge of Clara’s window. 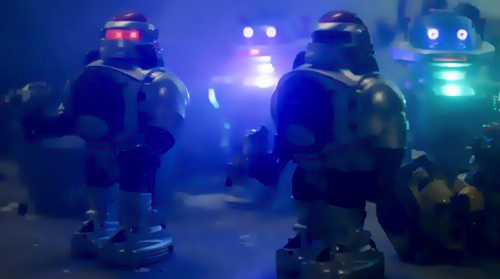 In some ways, “Last Christmas” had the feel of classic Doctor Who, with the Doctor and his companion facing a mysterious alien foe at an isolated base. Despite the name, the Dream Crabs were a formidable and fascinating enemy, especially because they make it very difficult to figure out where the real enemy is. Though the Inception-style dream within a dream, within a dream, within a dream, probably went a little too far. The last dream with Clara being aged was overkill. An aged Clara on “Last Christmas” after the announcement that Jenna Coleman would leave the show at some point felt a little contrived. It seemed a bit deceptive to be shocked by Clara having aged so much, only to be told it was only a dream. Maybe we would have been more on board if it had been funny in a Newhart sort of way. 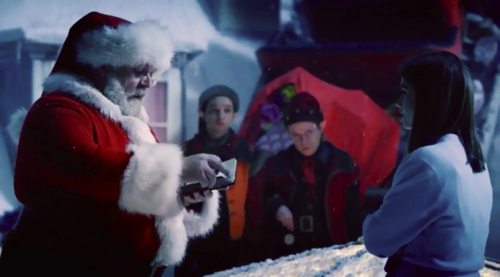 Nick Frost as Santa Claus certainly brought humor to the episode and created the holiday spirit we look for in Christmas specials. With all the discussion about whether Santa exists or not, let’s hope no young children were watching, though they never really said that he didn’t exist. The tangerine at the end was a nice touch, suggesting that Santa might still be around to fill up stockings. 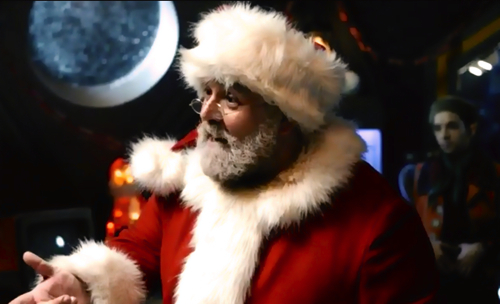 “Last Christmas” was an enjoyable Christmas special because of the interesting adversaries, Nick Frost’s comedic performance, and the emphasis on the Christmas traditions. We’re already dreaming about next Christmas. For more recaps, photos, and news about Doctor Who and other shows like iZombie, Constantine, Supernatural, Game of Thrones, and The Walking Dead, subscribe to receive notification of new spooky content by email. Or you can follow us on Facebook, Twitter, Tumblr, Instagram and Google+. Check out our Monsters of the Week and other scary and supernatural posts.